The Trump administration’s decision to cancel the proposed Trans-Pacific Partnership (TPP) trade deal has added uncertainty to the future of US trade with Asia. It is something of a shame given that, in essence, the TPP was a well-thought out agreement that would have assisted a number of US industries keep their global trade positions, while adding value to raw Asian sourced products. To be fair to Trump, the deal was pretty much dead in the water: the political arrogance in educating citizens over its content coupled with conspiracy theories over how the TPP would cost US jobs had long rendered the TPP a lame duck. For that, the previous administration should shoulder much of the blame. China, which was not included in the TPP framework, has shrugged its shoulders at the end result. For Beijing, a lack of participation only mattered in the sense that it would not be gaining additional access to the US industrial market in certain sectors. But with China wanting to move up the value chain, even with potential for greater US access, the TPP was always a deal it could live without: many industries in China have begun gravitating toward more cost effective environments in Bangladesh, India, and Vietnam. The demise of the TPP and the recent politicizing of trade have made China rethink what it really wants from free trade agreements (FTAs). A US that pursues a more belligerent approach to international politics and trade will concern Beijing. The sanctions imposed on Russia have seen the rouble lose half its value and the economy tank, though it is now showing signs of a post-Western influenced recovery. Russia, with a smaller and rather hardier and politically forgiving population than China, has been able to ride the storm. If such sanctions had hit China, the repercussions for upsetting its upwardly mobile middle class would have very serious implications for the government. The question for Beijing then becomes whether or not entering into trade deals involving the US or EU are a good idea when placed into the context of punitive punishments. Moscow’s experience rang alarm bells in Beijing and is changing the way China will address free trade with the US and EU. There are several regional trade agreements that China has recently been examining. Two of these have been proclaimed as ‘answers’ to the TPP: the Regional Comprehensive Economic Partnership (RCEP) and the Free Trade Area of the Asia Pacific (FTAAP). They have been touted as “alternatives” to the TPP. But are they? And if not, what else is in the offing for China’s multilateral FTA ambitions? This proposed free trade agreement is between the ten member states of ASEAN (Brunei, Cambodia, Indonesia, Laos, Malaysia, Myanmar, Philippines, Singapore, Thailand, and Vietnam) and the six countries with which ASEAN has existing free trade agreements (Australia, China, India, Japan, New Zealand, and South Korea). As such, it is a purely Asian deal. The main prize here for China would be to draw India and Japan into an FTA through the RCEP, which would give Chinese manufacturers access to two huge, dynamic, and powerful markets. China does not have full-blown free trade status with either, though it does with all other RCEP states via other multilateral agreements. But getting Japan and India on board will not be easy. Japan has ongoing political tensions with China, particularly related to territorial disputes. Many Japanese businesses are wary of China, and keen to keep innovative manufacturing technologies – such as advanced robotics – out of China’s reach. India, meanwhile, may slowly be beginning the process of taking over China’s mantle as workshop of the world. India will be wary of large quantities of cheap Chinese products entering their huge domestic market while Indian manufacturers are still in the process of upgrading and improving their own capabilities (the iPhone is about to start production in India). Cheap Chinese imports flooding the market would be politically disastrous and interfere with India’s transition to a global manufacturing hub. China, to be fair, probably agrees. A short-term gain in India is not want the Chinese want. Indeed, China will need Indian manufacturing capacity just to keep its own domestic consumers supplied with inexpensive consumer goods. The RCEP has also not been without its critics. It has gained some notoriety over what have been called “the worst provisions ever drafted on copyright protection”. While the negotiations continue – the 15th round was recently held in Tianjin – the RCEP and China will need to provide major concessions to India and Japan to get anywhere fast. At present, these discussions look like they will be an ongoing saga for some time to come. The FTAAP is an Asia-Pacific Economic Cooperation (APEC) initiative, which was given to China to evaluate following the 2014 APEC summit in Beijing. APEC’s members consist of 21 Pacific Rim nations and territories, including Australia, Brunei, Canada, Chile, China, Hong Kong, Indonesia, Japan, Malaysia, Mexico, New Zealand, Papua New Guinea, Peru, Philippines, Russia, Singapore, South Korea, Taiwan, Thailand, US, and Vietnam. As such, this grouping is the most similar to the TPP in terms of its geographic spread and economic potential. China was mandated to provide a report on the feasibility of the FTAAP by the end of 2016, but with uncertainties following the US presidential elections, particularly in how the new Trump administration views free trade, it is safe to assume that planning has been shelved for the time being. It is possible that elements of the aborted TPP deal could be re-invented under the FTAAP if the Trump administration softens its view towards free trade. But for the time being, given the current US stance, and the complexities of negotiating with 21 different sets of rules and regulations, the FTAAP seems a long way off. The issues facing the RCEP and FTAAP, coupled with the political and trade uncertainty leaking out from the US and EU right now, have lead Beijing to take a different tack, and one in which it can exert more authority. This new direction is tied directly with China’s One Belt, One Road scheme, and allows China additional muscle in terms of negotiating existing agreements. China’s demands for “mutually beneficial” free trade – meaning the opening up of Chinese markets to foreign products – are rather different to the deals currently touted by the US and EU. China wants, and has found it is possible to obtain, the following concessions when negotiating trade agreements with other countries: long-term political influence and reliance upon its security architecture. These are interests the West no longer prioritizes, and in many ways are well suited for the countries with which China can enjoy a sustained and mutual relationship. China has very specific strategic needs, including energy, commodities, agriculture, and water. As China’s domestic companies have now proven they can go it alone with foreign adventures and trade partners, Beijing can now focus on the bigger picture of securing essential supplies. To this end, China has commenced negotiations directly linked to these criteria. The Eurasian Economic Union (EAEU) is a free trade area that includes Armenia, Belarus, Kazakhstan, Kyrgyzstan, and Russia. While this grouping may sound somewhat exotic to some, the EAEU covers a great deal of territory and delivers what China wants in terms of political certainty, commodities, and energy. Trade is an additional, yet very welcome bonus. In total, the EAEU has an integrated single market of 183 million people with a gross domestic product of over US$4 trillion in terms of purchasing power parity. The area enjoys free movement of goods, capital, services, and people, and provides for common policies in the macroeconomic sphere, transport, industry and agriculture, energy, foreign trade and investment, customs, technical regulation, competition, and antitrust regulation. China’s application to have an FTA with the EAEU secures it long coveted access to Russian energy, and the ability to jointly develop mining and energy exploration throughout the region with respective governments, such as Kazakhstan, which is another energy rich country. This prospect is so attractive that other Asian nations are also getting on board the EAEU train: India, Iran, Singapore, and Turkey among them. Meanwhile, several countries have already signed an FTA with the EAEU, namely Moldova, Uzbekistan, and Vietnam. Of all the multilateral FTAs China is looking at, the EAEU promises the best deal in terms of offering China regional influence, commodities, and opportunities to sell services and infrastructure development. China has entered into FTA negotiations with the Gulf Co-Operation Council (GCC), whose members include Bahrain, Kuwait, Oman, Qatar, Saudi Arabia, and the United Arab Emirates. Jordan, Morocco, and Yemen have also been mooted as potential future members. As can be expected, this FTA is mainly an energy play, though China also has an eye on the potential for providing regional rail and related infrastructure development. Bringing the Middle East into the Silk Road orbit is part of Chinese, Russian, and Indian strategic policies, notwithstanding the issues between the Gulf states and Iran. If China can convince the GCC that its relations with Iran will not affect its relations with the Gulf, then the deal could manifest itself sooner rather than later. Negotiations have been ongoing since 2004, but renewed efforts have put the process back on track. It is possible that this FTA may be finalized in 2017. China has outstanding FTA negotiations with Georgia; it is also examining the potential for an FTA with Moldova. Russia would like Georgia to be part of the EAEU, while Georgians still harbor some ideas of joining the EU. Therein lies Georgia’s historical conundrum, is it East or West? A China-Georgia FTA would alleviate some of the pain of Georgia being prevented from being included in the EU, a situation which would better suit both Moscow and Beijing. Georgia’s strategic inclusion into the Silk Road rather than the EU is attractive to some, though China will need to make concessions to allow Tbilisi to look east. China may be winning the Tbilisi seduction battle against the EU, with the two sides concluding a deal last October, though this still has to be ratified by Georgia. Moldova already has an FTA with the EAEU, and while Beijing examines the potential for a bilateral FTA, it is more likely that these negotiations will become part of a wider multilateral deal should China agree to its EAEU FTA. The concept of China expanding its Eurasian influence, including financing and developing infrastructure in order to develop supply lines and promote security, has triggered imaginations. China, Russia, and their strategic Shanghai Co-Operation Organization partners have been in discussions to establish an SCO Development Bank, while Moscow has indicated it would be interested in discussing the potential for combining the existing free trade areas of ASEAN and the EAEU with the SCO, and creating a vast “Big Eurasian Partnership”. That is likely a step too far right now, and Beijing will want to see progress on the EAEU and SCO accession of India prior to expanding FTA ambitions further. The involvement of ASEAN in such a massive scheme will also include the governments of those countries; the Singaporean government has already stated its ambitions to increase trade and investment with Russia. China’s moves west into Eurasia, rather than the previous exclusive focus on the Asia-Pacific and EU, have not just begun with the proposed EAEU FTA. 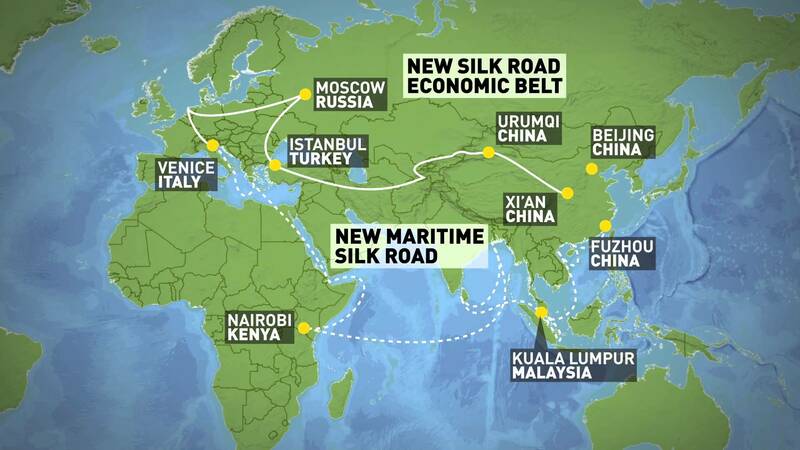 The move fits in exactly with China’s stated policy of developing the One Belt, One Road. China is serious about this and has instigated the Asian Infrastructure Investment Bank (AIIB), Silk Road Fund, and the New Development Bank (previously known as the BRICS Development Bank) as financing institutions. This moves hand in hand with China’s institutionalizing the Silk Road through the creation of the Shanghai Co-Operation Organisation (SCO), a Eurasian political, economic, and security body that includes China, Kazakhstan, Kyrgyzstan, Russia, Tajikistan, and Uzbekistan, with both India and Pakistan formally joining later this year. Dialogue partners and observer states include Afghanistan, Armenia, Azerbaijan, Belarus, Cambodia, Iran, Mongolia, Sri Lanka, and Turkey, with ASEAN, the CIS, and Turkmenistan as participating guests. This is a powerful organization, and suggests that the main centers of influence on the entire Eurasian land mass are starting to shift to Beijing, Delhi, and Moscow. China’s desire to gather support in Moscow and throughout the region has led to some already impressive financial and infrastructure commitments. It has lent Russia – through a consortium of the AIIB, Silk Road Fund, and BRICS Development Bank – close to US$10 billion for the development of the high speed Moscow-Kazan railway, and is keen to see this extend all the way through to Beijing. Such a project would cost an estimated US$250 billion, and China has indicated it can both fund and provide technology for this route. Russia itself is also preparing for financing infrastructure across Eurasia. The Moscow-backed Eurasian Development Bank has also been involved in projects, most close on Russia’s western borders, and is also getting involved with power and rail infrastructure developments in Kazakhstan. This combination of Chinese and Russian institutionalization of Eurasia, together with Indian involvement, is where the Chinese are now focusing on in terms of multilateral developments. China will continue to discuss with APEC and other countries about the respective FTAAP and RCEP agreements. But faced with an unpredictable US and the downsizing of the EU, FTAs with Western powers are looking less likely and less attractive. China will continue to engage in dialogue with any nation who seeks an FTA. But in terms of delivering what China really wants, the FTAAP and RCEP are slowly giving way to deals with the EAEU and the development of Eurasia, ASEAN, and the Silk Road. China watchers should be looking to China’s Eurasian policy development for future investment and infrastructure development trends. Chris Devonshire-Ellis is the Founding Partner of Dezan Shira & Associates – a specialist foreign direct investment practice providing corporate establishment, business advisory, tax advisory and compliance, accounting, payroll, due diligence and financial review services to multinationals investing in emerging Asia. Since its establishment in 1992, the firm has grown into one of Asia’s most versatile full-service consultancies with operational offices across China, Hong Kong, India, Singapore and Vietnam, in addition to alliances in Indonesia, Malaysia, Philippines and Thailand, as well as liaison offices in Italy, Germany and the United States. For further information, please email [email protected] or visit www.dezshira.com.